Those with a particularly British cultural literacy know the meaning of this great slang term, but for the rest of us (including yours truly), “gobsmacked” means “utterly astounded.” It also describes the reaction of Yeoman 2nd Class (SW) Lucien Gauthier, whose post to a U.S. Naval Institute blog recounts his amazement that a four-star fleet commander ended up attending his Nov. 30 re-enlistment ceremony. It started when Gauthier filled in a standard re-enlistment ceremony form’s question about “re-enlisting officer” with “Adm. 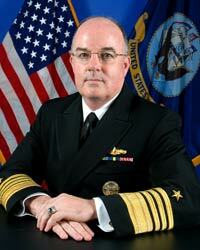 Harvey.” As in, Adm. John Harvey, commander of Fleet Forces Command. Gauthier didn’t know Harvey but had posted to his blog — anonymously — while he was stationed in Afghanistan. His chain of command on the San Antonio, however, wasn’t swayed by Gauthier’s admiration of the admiral and said, “No way.” Gauthier said he understood, and opted instead for his former supply officer from the ship. For December Wavetops: Cutline for story on ADM Harvey surprise visit says he is class of ’80. He is actually class of ’73.